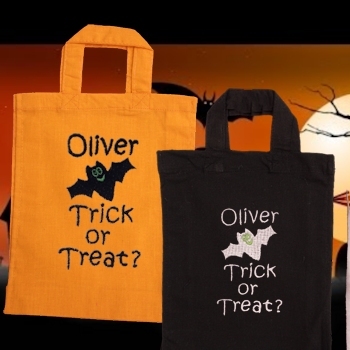 Personalised Trick or Treat embroidered mini cotton tote bag to collect all of the great treats on Halloween night. Embroidered Halloween Bat motif on your choice of mini cotton tote bag in orange or black. Enter the name you would like personalised and choose the colour of bag you would like. 100% cotton mini tote goody bag with short handles and a side gusset so this little bag holds a fair amount of treats!